At some point this April Meghan Markle and Prince Harry will welcome a little girl that they'll name Diana. That is, if those in the crazy world of royal baby betting are to be believed. In fact, Irish bookmaker Paddy Power is so convinced by the influx of people putting their money on Baby Sussex being a girl that they suspended all future betting on the infant's gender. As for the likely moniker honoring Harry's beloved late mother, Princess Diana, it's the odds-on favorite at 8/1 but a slew of other names rooted in the monarchy's storied history—think Alice, Victoria, Grace and Elizabeth—have also made the list. While Meghan let slip her general due date—some time in mid-to-late April—during her and Harry's Monday visit to Birkenhead, Merseyside, she "said she didn't know whether they were having a boy or a girl," Daily Mail correspondent Rebecca English tweeted. "She said she wants it to be a surprise!" What hasn't been left up to chance, though, is just how ready the pair are to embark on this next adventure. Long before they were set up on that fateful 2016 blind date that changed the course of each of their lives along with the face of the British monarchy, both the 37-year-old Suits actress and Britain's affable prince, 34, were speculating about the future that awaited them. And though it'd be hard to argue they were on similar paths, what with Meghan carving out a career in the ultra-competitive world of acting and Harry having the whole of his life planned out for him thanks to the luck of genetics, they were both certain they'd arrive at the same destination: taking care of miniature versions of themselves. "Of course, I would love to have kids right now, but there is a process that one has to go through," Harry told Britain's Sky News in 2015, having been on his most earnest search yet for a suitably intriguing princess following his split from Cressida Bonasthe previous year. "It would be great to have someone else next to me, but the time will come. Whatever happens, happens." What happened, naturally, is that Harry let it slip to childhood pal Violet von Westenholz just how eager he was to get the show on the road so to speak, and the Ralph Lauren publicist realized she knew the perfect match, a strong independent type with a passion for philanthropy and the same deep-seated desire to contribute to the next generation. Her professional life coming along swimmingly, Meghan was thrilled to have realized one of her childhood ambitions. But her bucket list was far from complete. "My life is more amazing than I ever thought it could be. I dreamt of becoming a successful working actress, which I can now very thankfully tick off the list. And I also dream to have a family," she told Lifestyle magazine the same year Harry was musing about the steps it would take to make him a father. "It's all about balance, and I have so much happiness in my career and am fortunate to travel the world and see so many amazing things—it will also be nice to be anchored to something grounded and in the same place. Raising a family will be a wonderful part of that." Now the former network television star has a new gig that affords her the opportunity to see the world, or, at the very least, much of the 53 countries in the Commonwealth that she's now a youth ambassador for, and a place at Windsor Castle that she will be very much anchored to when she and Harry start bringing up baby this spring. And her dear husband will very much be a wonderful part of that. Birkenhead local Rebecca Blundell told The Daily Mail she was impressed with the attention the royal lavished on her daughters Lily, 6, and Lottie, 2, as he chatted with them ahead of their visit to a not-for-profit supermarket and cafe and a youth facility. "Meghan then came and I asked her if she was excited for the impending arrival," Blundell told the outlet. "She said she was thrilled and that Harry would be a fantastic father. I replied that she would be a fantastic mother and she looked really touched." The pair's natural affinity for children has been on display from their very first joint event in last 2017. Each time the duo walk along the queue of fans gathered to greet them at their engagements—the standard royal procedure known as a walkabout—they always seek out the elementary school set, taking time to ask children's names, offer hugs and accept bouquets of flowers and carefully drawn cards from their tiny hands. Such was the case on Monday when the duo encountered a group of kids with a special request. When they learned the children were blind and unable to catch sight of them, local member of parliament Frank Field told People, "Both of them went down on their haunches so the children could touch their faces." And when Meghan saw twitter TracyMarie's young niece, the six-months-pregnant duchess "went down on the floor to take a card she had made for her in braille," TracyMarie wrote. "They'll make great parents." For their first act, they're already taking steps to give their heir the sort of idyllic childhood Meghan experienced whilst growing up in L.A.'s San Fernando Valley. Though Harry spent his early years romping around the same Kensington Palace grounds that his nephews and niece Prince George, 5, Princess Charlotte, 3, and Prince Louis, 9 months, now call home, he was hoping for something a bit more remote for his own offspring. Quite simply, as one insider put it to The Daily Mail, Harry is keen "to escape the goldfish bowl of royal life." Looking to upgrade from their Kensington Palace digs, the quaintly charming, but still quite small two-bedroom Nottingham Cottage, the newlyweds were offered a plethora of options, including Apartment 1, the misleadingly named palatial 21-room spread next door to his older brother Prince William and wife Kate Middleton. Many assumed that was the spot the pair, and their offspring, would eventually call home with current residents, the Duke and Duchess of Gloucester reportedly more than happy to vacate to a smaller Kensington property. But upon returning from their first major tour—a 16-day whirlwind through Australia, New Zealand, Fiji and Tonga that saw them answering endless prying questions about their baby on the way—they revealed they had made a different choice, telling aides to start plans on the renovation of Windsor's 20-room Frogmore House. The site of their May wedding reception, the country spread is no doubt "a very special place for their royal highnesses," as the palace said in a statement. But that's just one reason the cottage appealed to the expectant pair. While there were practical considerations (the UK paper noted renovating historical Apartment 1 could cost somewhere in the neighborhood of the $5 million-plus spent to bring William and Kate's pad up to snuff), the main factor was the well-being of their future prince or princess or, more accurately, Lady, as their little girl would be known, with a son likely to be given the title Earl of Dumbarton. After all, George and Charlotte spent their earliest years at Anmer Hall in the far more remote village of Norfolk, a choice William was able to make for his family due to the 10-bedroom spread's proximity to his gig as an air ambulance pilot and his grandmother's blessing. "William is very grateful," a friend told Vanity Fair back in 2016. "It's enabling him and Kate to raise their family in a way that's as close to ordinary as they can get." But fully committing to royal life last fall meant giving up some of that peaceful anonymity, William's role as king-in-the-making meaning it was more important for him to maintain a London residence. Even in their new, far more public digs, William and Kate have remained committed to giving their brood as normal a childhood as is possible for a trio of title holders. A green space adjacent to their palace home gives the tots a place to run around, but should they wish to have a little more legroom at nearby Kensington Gardens, they open themselves to prying, curious eyes and photographers' lenses. "The Cambridges have their garden in the back, which is nice," a source told The Daily Mail, "but there is no real other space for children to play in." By contrast, Frogmore House at Windsor "is secluded, peaceful, tranquil and, most importantly, private," said the source. "No one will see them coming or going." Plus it comes with one very enthusiastic review. Having grown up in Windsor alongside older sister Princess Beatrice, Princess Eugenie, who now shares a Kensington home with new husband Jack Brooksbank, regaled Harry and Meghan with tales of her happy memories. "It was actually Princess Eugenie who convinced them to make the decision," a source revealed to Us Weekly, "as she had such a wonderful, peaceful childhood on the grounds of Windsor." And that's precisely what Harry and Meghan are hoping for their future brood. Speaking to Elle in 2015, Meghan waxed on about being raised in a picturesque area of Los Angeles, describing her neighborhood as "leafy and affordable." And though she will be bringing up her child some 5,000 miles and an ocean away, she's still hoping to replicate that quaint slice of suburbia. "They want their children to grow up in as normal an environment as possible," shared the source. Albeit, one with the type of luxuries afforded a member of the monarchy, even one as unlikely to take a throne as Meghan and Harry's eldest, who will be born seventh in line and move down the hierarchy each time one of their cousins has a child. Up until recently, Frogmore House had been used as staff quarters, and the five separate apartments hadn't been kept in the best of condition. "It's pretty dilapidated now," royal biographer Ingrid Seward, author of My Husband and I, told People. As such, the couple have already put together plans to update the landscaping on the grounds that they had used for both their wedding reception and engagement photos and, according to The Times, they believe they'll have to spend somewhere between $2.5 million and $3.8 million to convert the Grade II listed property into a comfortable family home. Planning documents show their intention to put in a green energy unit that will provide heating and hot water, add extra fireplaces, staircases and a floating floor, not to mention the type of top-notch security features necessary to make the prince and his duchess feel their little one will remain safe. "The cottage does need some updating and renovations," an insider told the paper. "It's much bigger than Nottingham Cottage, which only had two bedrooms and was very tight." The new spread will also reportedly have room for a private gym to suit yoga aficionado Meghan, a mother-in-law suite for her California-based mom Doria Ragland to stay and, naturally, a nursery fit for a king or queen. "Frogmore Cottage is in an extremely run-down condition and is needing a lot of TLC and heavy restoration to bring it up to standard ahead of the duke and duchess' moving-in-date," the insider told The Times. Just when that might be seems to remain up in the air and, as such, has left Meghan's birthing plans somewhat in flux. While most royal moms that came before her posed for the requisite first photo atop the steps of the Lindo Wing at London's St. Mary's Hospital, where pregnant women shell out upwards of $9,645 to deliver and then clink a glass of some of the finest champagne, Meghan and Harry are looking into other options, Vanity Fair reported in November. Should they be settled in Windsor by April, Frimely Park Hospital in Surrey, England is a strong possibility. Just 20 minutes from Frogmore and a world away from London's busy Paddington area, "It will be much less chaos and more of a private even than if she gives birth in London," a source told Us Weekly. 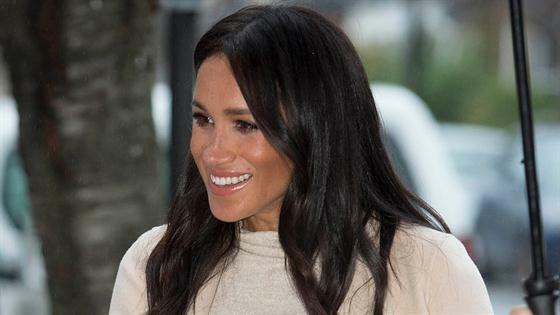 Though Meghan, who's reportedly been reading up on hypnobirthing, a mind-body technique employed by the likes of Jessica Alba and Tiffani Thiessen in the hopes of having a calmer, less painful natural birthing experience, could also opt for a home birth. But so far, aside from telling one hypnobirthing instructor at Monday's engagement that what she does is a "special thing", Meghan has yet to give any indication of how she intends to welcome Baby Sussex into this world. Everyone has a suggestion, with Meghan admitting to a group of Australian schoolchildren just days after their big announcement that they already had a "long list" of suggestions to look them over. She received another during Monday's walkabout when 7-year-old Megan Redford offered up Amy as an option, the name of Meghan's assistant private secretary Amy Pickerill. "I asked her whether she would call her baby Amy if she has a girl," Redford told The Daily Mail, "and she said, 'That's a really pretty name. I like it. We'll have to think about it.'" And then there are those convinced that the royal pair have been dropping hints about the moniker all along, leaving a trail of clues for those industrious enough to put it all together. For Blundell it was a seemingly spur-of-the-moment move Harry made after chatting with her daughters: "As he was walking off, he turned back and asked Lily if she spelled her name with an I or a Y. I straight away thought that must be a name choice." Even Prince Charles has gotten into the action as overeager grandparents are wont to do. During November remarks at Australia House in London, the future monarch joked, "Just between us, I suspect that Kylie and Shane may possibly make the short list. But ladies and gentlemen I would not hold your breath for Edna or Les." But he, like everyone else, will just have to wait it out. William and Kate took four days to share little Louis' moniker, the reveal coming long after the royal salutes were fired from the Tower of London, the official birth announcement was placed on the gold easel outside Buckingham Palace and the self-proclaimed Royalist Town Crier did his thing complete with scroll and bell. And no doubt Harry and Meghan intend to do the same. Until then, they have plenty else to sort out. Meghan has been giving her mom the hard sell on relocating from her L.A.-area home to England with mixed results. "Doria plans to be around a lot when the baby arrives, and there are plans for her to have a dedicated space at their new home," a source told Vanity Fair. "She wants to be on hand to help Meghan and Harry with the baby." Still, another insider told Us Weekly, "Doria hasn't made any commitments," when it comes to becoming a permanent resident of the country. "She has told friends that she would keep her house in Los Angeles but is indeed planning on spending a majority of her time with Meghan." As such, the couple are already on the hunt for a nanny "someone trusted and trained at one of the best places in the U.K.," a source insisted to Us Weekly. Particularly because Meghan has no intentions of letting her new family commitments get in the way of, well, her other family commitments, her job boiling down to essentially doing good work and helping people on behalf of the British monarchy. Having just been announced the patron of four organizations, "Meghan is very American and wants to get things done—that is her way," royal biographer Seward recently told People. "She hits the ground running and works hard. That is in her makeup." So expect her to continue her current work schedule, even if that means taking comments about her weight in stride and teetering around in four-inch Stuart Weitzman heels. And after her little one's much-anticipated April arrival, well, hopefully little baby Diana is a people person.